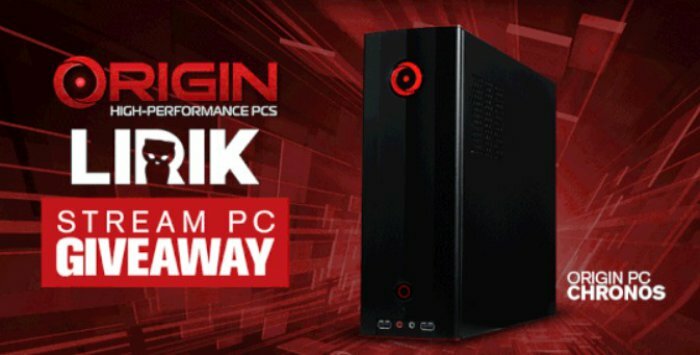 OriginPC has teamed up with Lirik to gift one of their fans with brand new gaming PC! To enter in this Custom ORIGIN PC CHRONOS Stream PC Giveaway grab your free entries by following few simple steps listed down below! t has long been believed that tiny desktops cannot be powerful PCs and that a small footprint means you have to make compromises. It’s time to put that outdated way of thinking to rest. Enter the all-new ORIGIN PC CHRONOS. Designed from the ground up to pack the raw power of the most powerful desktop components on the market in a tiny, desk-friendly chassis, the CHRONOS is a no-compromise solution for the space-conscious user. The ORIGIN PC CHRONOS is as flexible as it is compact, capable of being situated in four different orientations either vertically or horizontally, thanks to its innovative magnetic feet and rotating backlit logo. Effortlessly move the feet to any part of the steel chassis and flip the CHRONOS to whichever position your heart desires. Finally, rotate the backlit ORIGIN PC logo to match the orientation. Once set up, just push the power button and get lost in your favorite game or application. Bonus entries: Share your referral link with friends to get additional 100 entries for each person who enter through the link.